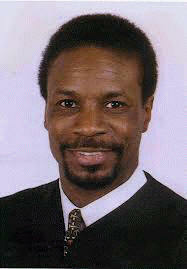 The Honorable Herman Marable Jr. 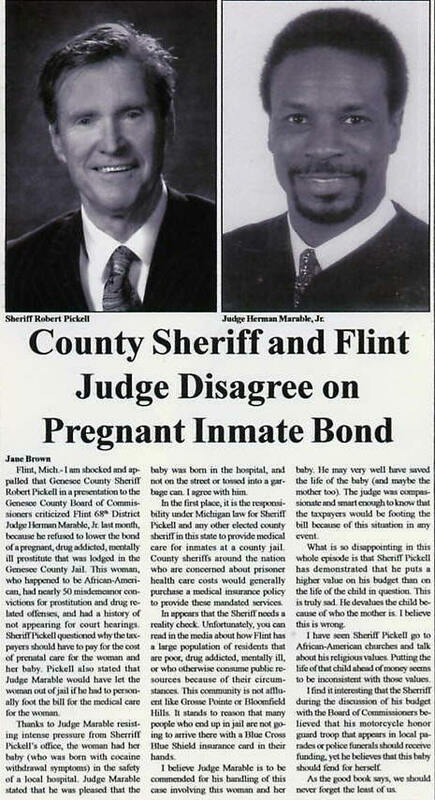 The Flint Enquirer Interviews 68th District Court Judge, The Honorable Herman Marable Jr. Flint 68th District Court Judge Herman Marable, Jr. elected in 2000 in an upset victory over Judge Raymond Branch is again on the campaign trail for a second term. Flint Enquirer Publisher Ronald Parker talked to Judge Marable at length about a number of issues. The judge discusses his views on issues and alternative ways the court can best serve the public, and gives his judicial philosophy. Flint Inquirer: Why did you grant the Flint Enquirer's request for an interview? HM: It's important for the voters to hear from me in my own words about some of the things that have appeared in the press. I believe the Enquirer is fair and balanced. That cannot always be said about the Flint Journal and the local television news outlets. FE: Let’s talk about some of the things that have been said about you. You have been accused of processing cases in your courtroom slower than other judges. How do you respond to that charge? HM: First, I would say that I am sensitive to the fact that we have to be efficient in how we process cases at the courthouse, but judges make decisions that affect people’s lives. We are impacting this community with the stroke of a pen. The stroke of a clock may not be the only consideration here. We need to make sure that we are getting it right. I frequently take extra time to explain to those people that appear in front of me what their rights are when I don’t believe they understand what is going on. FE: Is this an issue for people that come to your court? HM: Unfortunately, it is an issue. A majority of the people that appear in front of me on criminal cases are young people between the ages of 17 and 27. Most of them have either dropped out of school, or were kicked out. Most of the defendants on misdemeanor cases come to court without lawyers. Keep in mind that nearly 50% of the kids in high school in the 68th District (City of Flint) do not even maintain a "C" average in school, and that the high school dropout rate in Flint is above 30%. Factor in that about one third of adults in the city of Flint are functionally illiterate. You can see that I deal with a large population who do not understand how the justice system works. They don't understand their legal rights very well. Many have difficulty reading the legal paperwork that they must sign. FE: So, you are saying that you take the extra time to explain to defendants their legal rights in your court room. HM: Yes, if I believe they don't understand. I work very hard everyday to see that people have the opportunity to truly be heard in court. FE: I know that you have talked about this in the past. Why would this be an issue; isn't that part of your responsibility as a judge, to explain to the people their rights when they come to your court? HM: Yes, it is my responsibility, but my detractors at the court and a few attorneys have attacked me on this and other issues. But I will tell you that I do not consider myself to be a part of the cliques in the legal community. I suspect that if I were in the clique, I would have fewer problems. But remember the cliques did not elect me to office; the people of Flint elected me to represent them at 68th District Court. A major priority for me is to work toward my goal of seeing that the courts be closer to the community. And that's what I will continue to do. FE: Why don’t you believe you are a part of the legal community "in crowd?" HM: I have many supporters in the legal community. However, you have to understand you're not going to be part of the "in crowd" if you are not going along with certain attorneys and all of the deals they want for their clients. FE: Does race play a role in this? HM: Sometimes it does. I have told you in the past that A. Glen Epps [a prominent Flint Black Civil Rights Attorney who died in 2002] was a mentor to me. Glen reminded me that change comes slowly. Glen was a pioneer when he began practicing law in Flint in the 1950's. When he came to Flint, African-American attorneys were not very welcome, due to racism. It was not until the mid 1960's or later that African-American attorneys began to actively participate in the Bar Association. It has never been lost on me that a few of the "old guard" attorneys who were practicing law at the time have passed on their law practices to their descendents. It would be naïve to think that racism has been completely wiped out. FE: Talk to me about the "no confidence" vote taken by a group of black attorneys. HM: We have about 40 African-American attorneys in Genesee County. The Mallory, Van Dyne Scott Bar Association has seen little activity in the last couple of years. The purpose of the group is to promote the interest of black attorneys and to educate the community on the law A good example is a program that I participated in two years ago to commemorate the 50th Anniversary of the Brown v. Board of Education decision. FE: Do they make political endorsements? HM: The by-laws of the group specifically state that they are not to make political endorsements. This is in part due to the non-profit status of the organization. It has been reported to me by officers of the group that about 4 attorneys and one of my fellow judges voted for "no confidence." There were reportedly about six attorneys or so at the meeting. In fact I have been told by many African-American attorneys that they did not get notice of the meeting, and that they did not agree with the vote of "no confidence." out this "no confidence" letter using his law firm’s envelopes. Fletcher helped to orchestrate the whole situation. Judge Perry, who supports my opponents as I understand it, participated at the meeting. Fletcher and Perry are fraternity brothers. FE: Is it true that the letter was unsigned? HM: Yes that is a fact. I have been told that none of the officers of the organization were even willing to sign this document. However, I have been endorsed by a wide cross section of groups and individuals inside the community such as the Greater Flint AFL-CIO, the Genesee County Democratic Black Caucus. I have also been endorsed by the Flint Area Building Trades Council, and The Genesee County Democratic Women’s Caucus--who did not endorse my female opponent. I was even endorsed by The Rev. Al Sharpton when he came to Flint to discuss violence and the importance of voting in the election. The bottom line is that we have a three-person race for two seats. If you take a "no-confidence" vote against one candidate, that is a back-door way of endorsing the other two. But I am not concerned what a couple of elitist lawyers who have bashed me for years say. They don’t even have the "confidence" to place their names on and stand behind their letter. They know as well as I that their allegations are untrue, and this is all about politics. I believe the voters understand that as well. FE: You have told us in the past that your judicial philosophy may be different than some of your colleagues because of your background and experiences. What has been your approach? HM: When I ran for judge, I said that the court needed to be closer to the community and that there needed to be change. I also said that I would be fair, and make the punishment fit the crime. I also said that we needed to bring the courtroom to the classroom. I believe I have made good on those promises even though I have been obstructed, and opposed by some of my colleagues in the things that I wanted to accomplish. I’m sure that your readers understand that Flint is not the same city that it was years ago. We have the highest unemployment rate in the state. We have the highest poverty rate in the state. I discussed earlier the problems we have with low achievement and high dropout rates in the schools. But, we also have a very high crime rate. We have a high rate of drug usage and all of the problems that come with that. FE: How have you addressed these issues? the Judge Marable Citizens Advisory Committee. I felt that citizen input was very important. Some of your readers know that I am a big believer in innovative sentencing. I have sentenced non-violent offenders to do community service as a part of their punishment. For example, in addition to a traditional sentence, I sentenced three young men who were caught painting graffiti to 90 hours of community service covering up graffiti with a local association. I normally sentence illegal dumpers to clean up neighborhoods with local groups. from doing the community service. I have even had some of my unemployed defendants offered jobs by some of the agencies where they did their community service. In other words the community service assignment was the foot in the door that they needed to be offered the opportunity for work. That is very powerful when we can take a negative situation, and turn it into something that lifts a man or woman up so that they can support themselves or their families. FE: That is quite remarkable. innovative sentencing that does not crowd the jail. people (especially the young men) that I see in court. I am the first male authority figure that tells them that they have to do something, and they know that I have the ability to back up my directive. I accept this role as a part of my responsibility to the community. FE: Speaking of the young people, talk with me about your Student of the Month/Year program. HM: I want to first thank the Enquirer for publicizing the achievements of the students, and letting the community know about my Student of the Month program. As many of your regular readers know, we are beginning our third year of this mentoring/scholarship program. I give a savings bond each month to a 10th grader who either lives in or attends a school located in the city of Flint based on their completion of an essay about their career goals. some of the community problems that I spoke of earlier is in investing in and mentoring our youth. FE: Don’t you have a program for Senior Citizens too? HM: Yes, we have the Herman, Sr. & Iris Marable Senior Citizen of The Month Award. This program recognizes those over age 60 in Genesee County that have performed community service. The award was named for my mother and late-father because they were active in community service efforts, and they inspired me to become active in the community. I agree with Hubert Humphrey when he said that as a society we will be judged by how we treat those in the "dawn" of life (our youth); and how we treat those in the "twilight" of life (our elderly). That is one of the reasons that we do these programs. FE: Readers can get more information by going to your website, www.judgemarable.net Why do you believe the voters should re-elect you to office? HM: I made certain promises and I have kept them. I am connected to the community, and I am proud of that fact. We have had a lot of negative things and hardships to occur in Flint over the last several years. I have tried to be a positive force—a positive leader in the community. I am pro-active and I believe that the measure of a judge’s performance particularly at the District Court which is the "people’s court" must be judged on more that what happens in the courtroom. The fact is much of the discretion that judges once had has been taken away by mandatory sentencing, standardized fines, and other factors. We are obligated to enforce the laws and ordinances in the cases that come before us. I have been very blessed to serve my fellow citizens for the last six years and I would like to continue. I am asking to be returned to office to fight the good fight. I am fair to people. and outside of the box. We have to go beyond the status quo if we want to have a better and safer community. A few legal system insiders and detractors have attempted to run a smear campaign against me. They are fighting to protect their turf and special interests. It is our citizens who will have the final say in this election, not the legal system insiders. I believe I have the vision to utilize our court system so that we address some issues in the community. Although I have had to overcome many obstacles since I have been there, I have kept my promises. FE: Thank you for talking with us. Judge Herman Marable, Jr., 68th District Court Judge, and his Citizens Advisory Committee has announced the establishment of a new award designed to recognize area senior citizens for their community service. The Herman Sr. & Iris B. Marable Senior Citizen of the Month Award is named for Judge Marable's mother and late father. The honor will be given to local senior citizens, age 60 or older, who have participated in efforts to improve the community. Judge Marable discussed how the idea for the award came about. "This is a spin-off of our Student of the Month program. A couple of senior citizens who heard me making a presentation about the youth award told me that they wished they had the opportunity to be recognized as well, so we are addressing this desire." Marable further explained, "It is important that we recognize and honor those seniors who have helped to build our city because we all stand on their shoulders." Judge Marable explained that he decided to honor his parents by naming the award for them because they inspired him to serve the community. "My parents were both active in the Flint community. My father was active in the Open Housing movement in the 1960's, and in human rights causes in later years. My mother helped to form a block club on our street. I was taught that giving back to the community was very important." Judge Marable's Citizens Advisory Committee will review the nominations, and will select the awardees. Nominations for the Herman Sr. & Iris B. Marable Senior Citizen of the Month Award may be made by individuals, organizations, block clubs, faith-based organizations, or others. Nomination forms and further information can be obtained from the office of Judge Herman Marable, Jr., 68th District Court, Courtroom 1, McCree Courts and Human Services Building, 630 South Saginaw Street, Flint, Michigan 48502. Nomination forms may be obtained from the www.judgemarable.net website.